How to create a dashboard using Quality score for Adwords keywords? 1) It can’t be queried alone. For an obscure reason, you have to use the Quality Score metric in conjunction with other metrics like clicks or impressions. Otherwise, you won’t get any data. 2) It can only be used with the Keywords dimension. The Quality Score in only available through Adwords Keywords Performance Report. Actually, it’s also supported in Managed Placements Performance Report, but this one isn’t available in DashThis. So, how do you create a KPI (Key Performance Indicator) that displays Adwords Quality Score? First, you can add the newly created “Top Keywords with Quality Score” widget in a single click. Then, you can use the Custom Widget. 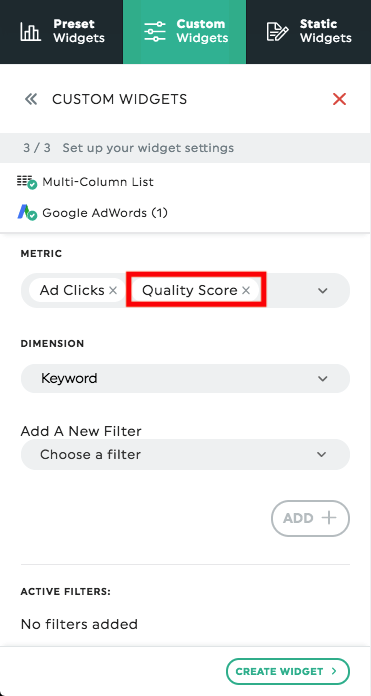 You have to choose the Multi Columns widget, then select a least one other metric than Quality Score and finally, you have to choose the Keywords Dimension. That’s it! Feel free to contact us if you need any help with this. How to create a dashboard using Google+?